Ribbon Cutting at Three Oaks Water Reclamation Facility | Wharton Smith, Inc.
On Jan. 17, Wharton-Smith joined with representatives from Lee County, the Florida Department of Environmental Protection, CDM Smith Engineering and facility staff to celebrate the completion of the Three Oaks Water Reclamation Facility Improvements project. See more pictures. During the ceremony, Lee County Project Manager Lyssa Lott complimented the Wharton-Smith team for finishing on time and under budget, despite some really challenging construction obstacles, most notably very difficult dewatering constraints. “I was very proud of our team for enduring 20 inches of rain in 40 days and a tropical storm followed by Hurricane Irma, yet still pushing forward barely missing a beat to complete this project for the County on schedule,” said Don Mullaney, Project Executive. 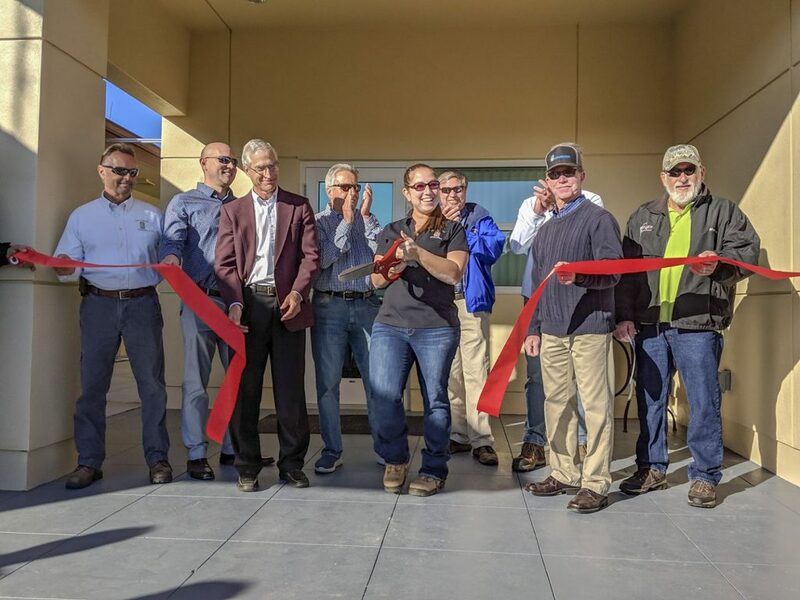 After the ribbon-cutting, attendees toured the facility learning not only about the improvements but also how the water reclamation process works. The $24.5 million project for Lee County Utilities brings the facility’s capacity up to 6 MGD with site layout space expanded to 8 MGD for future needs. The following additions were made – a 1.5 MG oxidation ditch, three 85-foot diameter clarifiers, additional electrical building, headworks channel extension with weir gates and drop boxes for the new and future oxidation ditches, extension of the existing clarifier splitter box, new RAS/WAS pump station, new splitter box for two of the new clarifiers with weir gates for an additional clarifier, and a second belt filter press. Along with these items other modifications and maintenance were completed to the rest of the facility. Congratulations to the project team of Don Mullaney, Dave Snyder, Cassandra Hitt, Greg Schneider, Steve Becker, Tyler Wilburn, Andres Velosa, Todd O’Donnell and Bob Hahn.